It’s not unreasonable to say that our modern world wouldn’t be possible without a way for humans to control the electronics that power everything from computers, to small gadgets, to the cars we drive. Until recently, interaction meant connecting a physical switch, whether this meant the humble microswitch invented in the 1930s, or a more complex array like those found in computer keyboards. Much of this operator input has migrated to touch-screen interfaces — in the case of smartphones especially — but often a physical button is advantageous if users need to quickly access a certain area. Even with the trade-off of not being able to use that space for multiple inputs and data outputs, this type of interface can be much faster than scrolling through multiple menus just to press start or stop. This increased speed of a physical button is evident when button locations have been memorized. For a new device, however, another advantage that touch screens have over buttons is the use of icons to indicate actions. According to this Popicon article, roughly 90% of the information processed by the human brain is visual, and our brains can process visual data 60,000 times faster than text. While this might seem trivial when deciding which button to press on a washing machine, in situations where time is critical, such as having to glance at a dashboard control on an automobile or even reading street signs, milliseconds matter. The use of icons also means that there is no concern about displaying a word in different languages. As an ancient example, consider that Chinese characters can be read across multiple dialects and languages, skipping the idea of how a word is pronounced to directly convey meaning. On a much simpler level, the same could be said for a button that has a simple action drawing on it. A picture of a light bulb could indicate a button that lights up a room, while a series of axially arranged blades might indicate fan control; both are easy to interpret regardless of the user’s native language. As noted earlier, traditional buttons work by closing contacts to allow electricity to flow. While fine in many situations, this technology has been around in one form or another since the dawn of electrical appliances, and it involves the physical movement of internal and external parts that can eventually wear out. 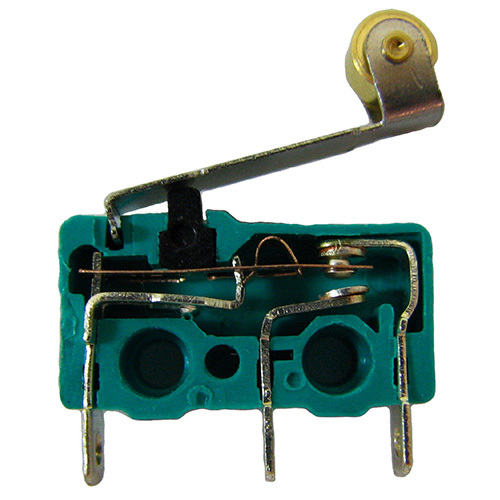 Additionally, physical switches have the potential to “bounce,” where contacts intermittently form a connection until it settles in its proper state. This can normally be compensated for through software or hardware methods, however the extra complication presents a minor but real nuisance. 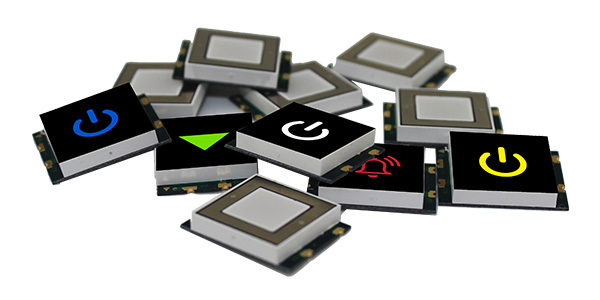 As an alternative to traditional contact-based switches, consider the CSM series illuminated, surface-mount, capacitive-touch sensor display by Visual Communications Company (VCC) for a future design. These components, which feature the smallest footprint in the industry for this type of sensor, measure 15 mm square and can be ordered in a variety of LED-illuminated colors for easy recognition. These capacitive touch buttons can also be imprinted with a library of standard icons, and custom images can be ordered as well. As solid-state devices, there is no mechanism to wear out and the need for software de-bouncing is a thing of the past. An additional benefit to this type of sensing technology is that since capacitive sensing only works with a semi-conductive material like human fingers (even through clear glass or plastic), they will not respond to false presses from a variety of inanimate objects. So if a sensor is accidentally pressed by a broomstick, an airborne child’s toy or an errant robot, the device won’t typically respond. Something to consider in an unpredictable environment. There is certainly a place for traditional buttons and there will be for some time. VCC capacitive touch sensors, however, present an innovative solution when physical contacts won’t do the job, and a full touch-screen interface is either overkill or inappropriate for the situation. For more information on capacitive touch sensors and other products, click here.